The Skinny: Subdued follow-up to the terrific Fight Back to School is still entertaining despite the drop in overall fun. Much less frenetic than you would expect from an early nineties Stephen Chow film. Follow up to fresh and funny Fight Back to School is less fresh and less funny. Stephen Chow returns as ace undercover Chow Sing-Sing, who gets demoted to traffic cop when he cheeses off one of his superiors. Even though he's been barred from the case, he decides to go undercover at a local international high school to stop evil terrorists bent on terrorizing people. Problem is: the cops don’t want him there but he does it anyway. 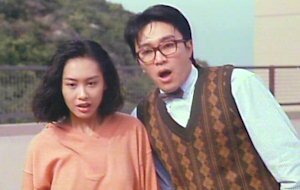 Also, he briefly romances Athena Chu (which does nothing for his engagement to Cheung Man) and beats up boss Ng Man-Tat in every other scene.